It is no secret that a bearish Head & Shoulders pattern on the S&P 500 Index appears to have formed on daily bar charts. A good deal of attention has been paid to the development of this formation earlier last week by a number of broadcast business sources. Bearish technical divergences, a loss of bullish momentum and a decline in trading volume have accompanied this set-up, as it should be. Interestingly, the target or “objective” of this near-term pattern suggests that a pullback to the 818 level is now likely. 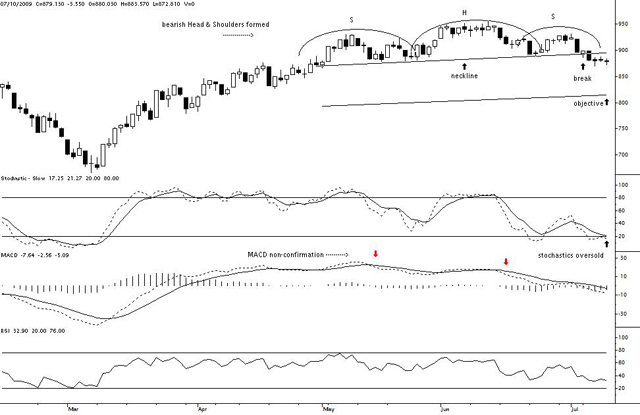 This is an interesting observation since the targeted level of the bearish Head & Shoulders pattern coincides roughly with an expected correction that may well result in the formation of the “right shoulder” of a larger, more important bullish reverse Head & Shoulders pattern on weekly charts. Another thing worthy of note is that this larger bullish pattern is remarkably similar is size and scope of one that developed between 2002 and 2003 following the shock of 9/11. If is assessment is accurate, volume levels should begin to increase considerably as the 818 area is approached. Volatility levels should also rise briskly as the distribution of shares takes place. If these technical features along with basing price activity are present when the pullback occurs, there would be a good case to be made for a brighter second half on 2009 regarding the S&P 500 Index. Failure of a reversal of this kind to develop, however, would become a worry which could bolster a more bearish scenario for stocks in the quarters ahead. Can Anyone Make Sense Of The Dollar? In a world of relativism, increased attention in board rooms, on trading desks, on broadcast business stations and at summer barbeques (where supposedly a lot of financial banter takes place), has centered on the value of the dollar and more importantly where it is headed. In comparison to last year’s 4th of July festivities, the dollar buys more gasoline, more ears of corn, more hamburger patties and, of course, more residential real estate. Automobiles, both new and used, are also attractively priced in the bargain aisles. There are, however, some sticky issues that accompany all of this. Credit, for example, is not cheap. In many ways it is now being allocated similar to World War II ration stamps of a different generation. Massachusetts has just raised its sales tax rate by 25% (from 5% to 6.25%) making additional purchases by consumers a bit more expensive. That level of revenue hiking, however, seems like a deal to tax paying residents of California, New Jersey, Rhode Island and Tennessee. Property taxes, on the other hand, present a real conundrum. As values of most residential dwellings decline, property taxes on homes are rising and could continue to do so at a brisk pace for years to come. As wages stagnate, rising property taxes could eschew future buyers away from purchases and reinforce lower property values instead. It could also handcuff future lenders from lending, keeping the velocity of money at anemic levels for some time to come. There are a lot of U.S. treasury notes and bonds that have to be issued over the coming years, however. In theory, this issuance should eventually force the value of the dollar lower relative to a basket of currencies and to a basket of commodities. It also could tend to “crowd out” the purchase of other forms of investment vehicles including stocks and bonds. Nevertheless, the debate over whether inflation or deflation will “win out” has not gotten any clearer lately. 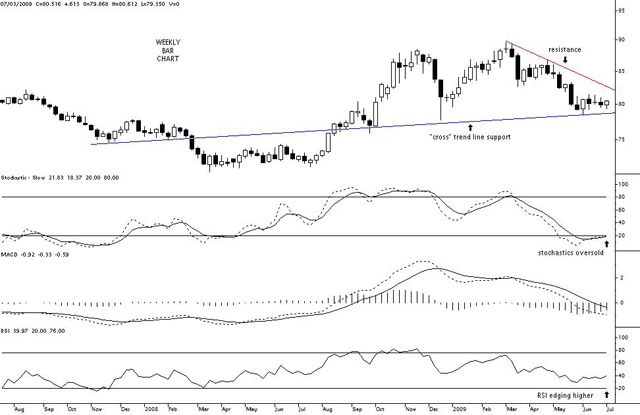 Technically, the U.S. dollar index (DXY) is currently in an oversold condition and is in position to move higher following a successful test of key trend line support on June 2nd at 78.334. Interestingly, important trend line resistance sits just above current readings at 82.50. A break above that level would likely be accompanied by both out right buying as well as short covering. Recent discussions by foreign holders of dollar denominated assets who are pushing for a move away from the greenback as the world’s reserve currency would find an unexpected dollar rally a relief from their current concerns. A solid break below former support at 78.334, on the other hand, would only increase the pressure to find an alternative to the dollar. For the moment, the current technical set-up favors a rise in the dollar index. You are currently browsing the Charted Territories blog archives for July, 2009.